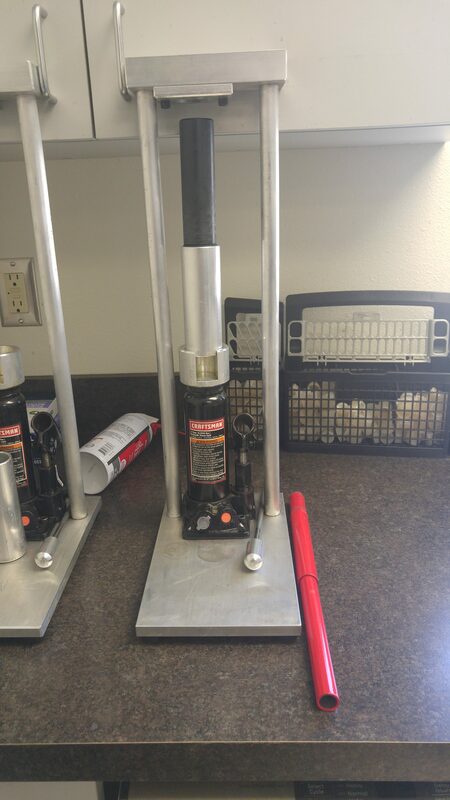 The golf hole cutter made work easy. This week we completed the drought experiment at Leland. The experiment was to see how climate change can impact plant competitive ability under drought and non-drought conditions. Last year the experiment was done with morning glory, and this year it is with bur cucumber. 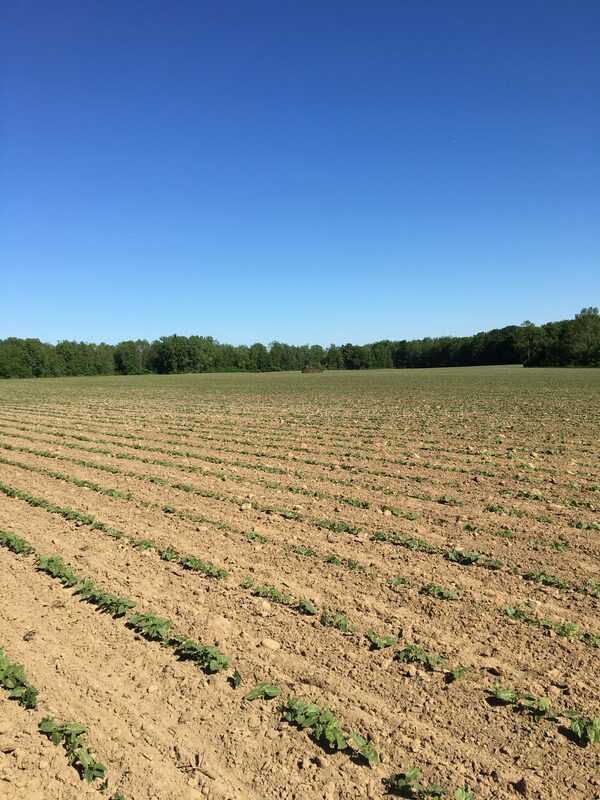 The bur cucumber was transplanted from a corn field in Barton to our field in Leland. We then placed 16 rain shelters into the field. The plots in the field varied with different bur cucumber densities between corn rows, and each density had a drought and non-drought area. Then we put moisture sensors 6 inches into the ground. Rain water was collected in gutters and dispersed by tile drains. As we did moisture readings each week I got an idea of how well the shelters were working. 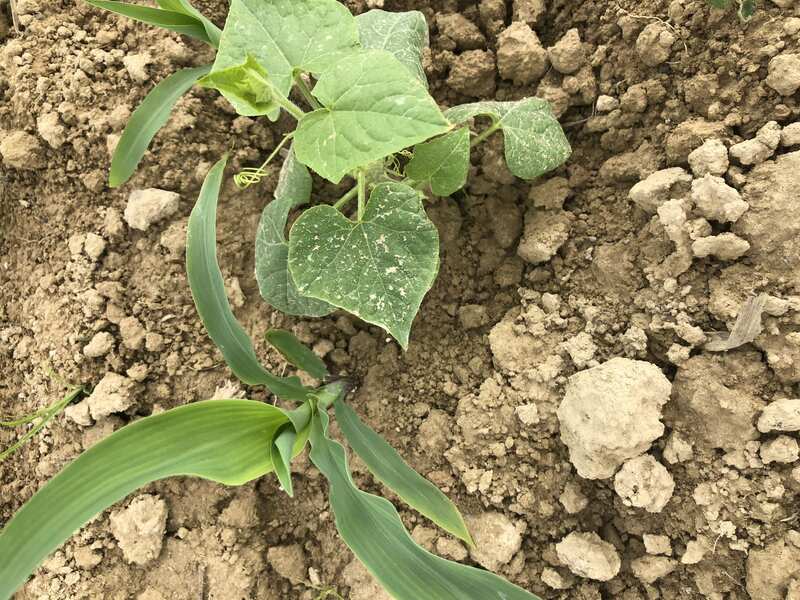 Bur cucumber within corn row. When collecting moisture readings I had to be careful not to trample the crops. This is a challenge when I collect Rye or Kernza samples. But in this field I had to be extra careful not to get caught in the bur cucumber or trip over the cable holding down the shelters. The Bur cucumber grew vigorously next to the corn using its tendrils to climb. For five weeks data was recorded. We discovered that a rodent had bitten one of the cables where were finding negative data. It is visible obvious that the corn under the shelters has been stunted. We also collected corn height for each subplot. Using the data we’ve collected we will get a better understanding of how climate change impacts weed species’ competitive ability. Hey everyone, I’m John Harvey, an Agricultural Sciences major. 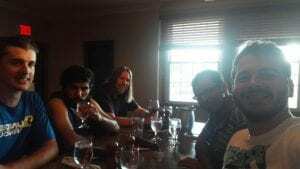 I would like to talk about my first weeks as an intern with the Nutrient Management Spear Program. Honestly, I had never worked outside of the family farm for the summer. I previously would be on the farm in an environment that I had been accustomed to being in. Same people. Same location. The day I first arrived at Morrison Hall, I was caught in a whirlwind. Not a person that I had ever seen before. Reality hit me of how much of a different setting this was from what I had been used to. I realized how little I knew about data collection and precision Ag. I knew from then on what it would take to help the program in as many ways as possible. From soil sampling to flying drones, there is always something to do. Everyday there are hands on learning experiences. Somehow, I am able to manage the many tasks that I have to do within the program. Most importantly, the major benefits of being part of the NMSP is the people. It is an honor to work with this team. We share common goals and interests. I realize good laughs is the way to form close bonds between one another. Everyday, I look forward to what not only the NMSP has to offer me, but what I have to offer the NMSP. Hey guys! My name is Sarah Gruntmeir and I’m a rising senior here at Cornell. I come from Oklahoma, and have a wheat and cattle production background. This summer, I’m working at Cornell Orchards with the pomology faculty on a variety of fruits. I chose this internship due to my previous (and current) love of eating apples and touring orchards. 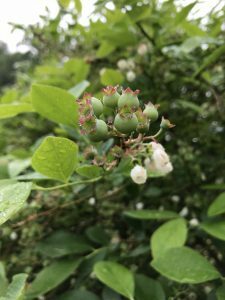 The first few weeks of the job have included weeding, training trees, battling groundhogs, setting up infrastructure for trees, and working on various research projects. 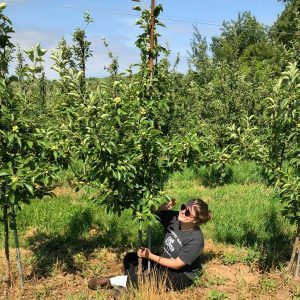 Research projects at the orchard have taken me across New York State, where I have learned about crop load management strategies, positioning and training practices, and tons more. This internship has given me the opportunity to learn about a different side of agriculture than my background provided and given me hands on experience in a field that interests me. 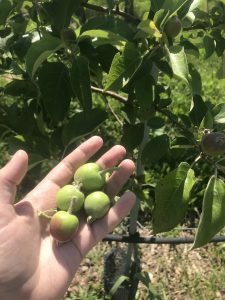 Here are a few pictures of the fruit crops I’ve spent time with! 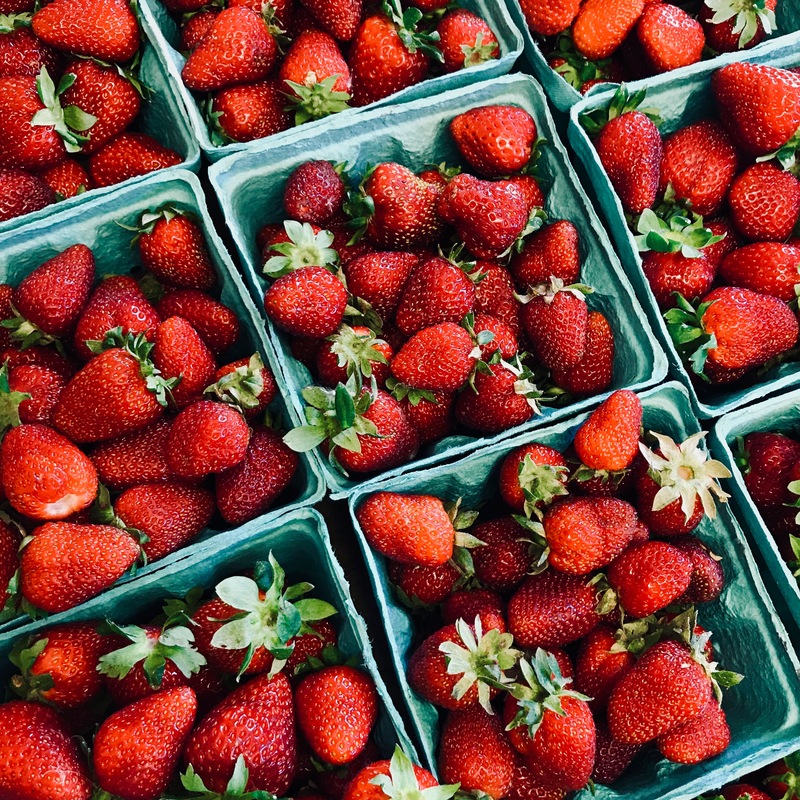 above: yummy strawberries from insect exclusion and fertigation trials. I even got to take home a quart after the data was collected! above: blueberries becoming more ripe by the day! above: hearty kiwis, which, to my previous lack of knowledge, grow well in New York! Stay tuned for future posts, where I’ll explain in depth the many aspects and projects included in my internship! Greetings from Ithaca! My name is Danilo Pivaral. I am going to be a senior agricultural sciences major. Although I grew up in Chicago, I have wanted to contribute to the food supply chain that fails many neighborhoods, by studying agriculture. This summer I am an intern in the Weed Ecology and Management lab at Cornell. As part of the lab I work on a couple different projects such as, the perennials project, seedling emergence, and drought experiment. My interest in sustainability led me to the perennial grain project, growing intermediate wheatgrass and rye. 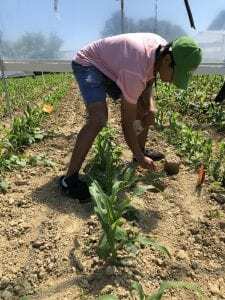 In the past five weeks I have helped pull weeds at the Musgrave Research farm and fields in Newfield and Ovid. The weeds we have mostly targeted are wild mustard and hairy vetch. These were controlled to prevent them from pollinating and reseeding for next year. Pulling the vetch was very satisfying and had to be put in bags and dumped away from the field because vetch seed continues to form even when pulled. The satisfaction came from freeing up a cluster of Kernza by pulling out a vetch from stem closest to the ground. Although weeds are an issue to farmers, they can be appreciated for their beauty and resilience to cultivation and herbicides. My experience as a home gardener has been limited to hand weeding. Though it is fun spending time outside weeding, herbicide application seems like an adaptable technology. This Internship will help me prepare for the weeds class in the fall and help me find a career in agriculture. By learning about how weeds are controlled in different fields, I will have another cultivation tool under my belt. Hello everyone, my name is Allyson Wentworth and I am a junior studying agricultural sciences and viticulture and enology at Cornell University. My interest in agriculture stemmed from the ten years I spent in 4-H training dogs. I was exposed to the agricultural industry and decided that it was the field I belonged in. 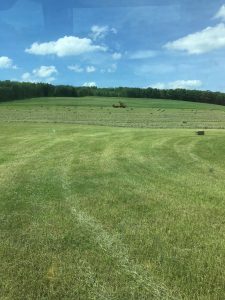 After deciding that agriculture was the path for me, and arriving at Cornell, I quickly learned that I wanted to focus on integrated pest management (IPM). During September of 2017, I managed a post-doc student’s research on phylloxera, a common grapevine pest that devastates vineyards by feeding on the rootstock. 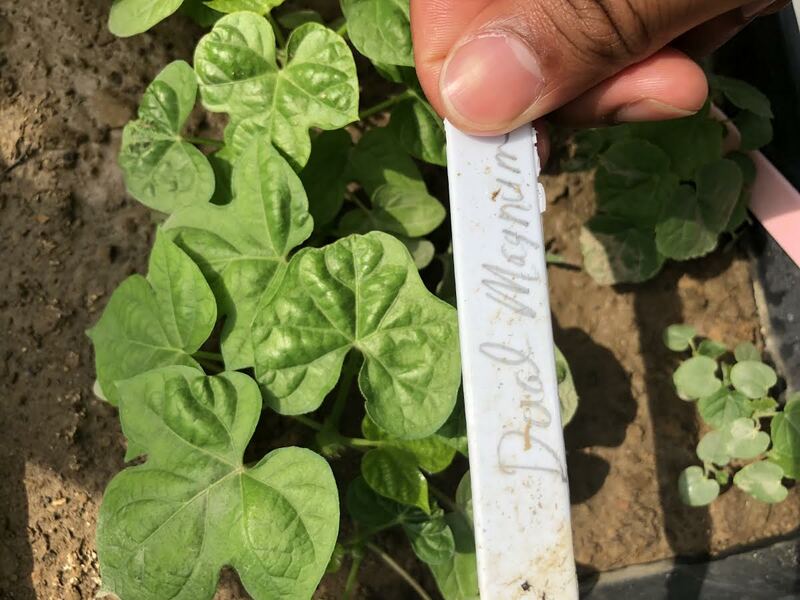 The goal of this research is to discover what signaling causes the phylloxera to feed on some varieties of rootstock, and not others, and whether there is a plant out there with similar signals that can detract the phylloxera from the rootstock. After working with this research for a month, I decided that I wanted my summer internship to focus on IPM. 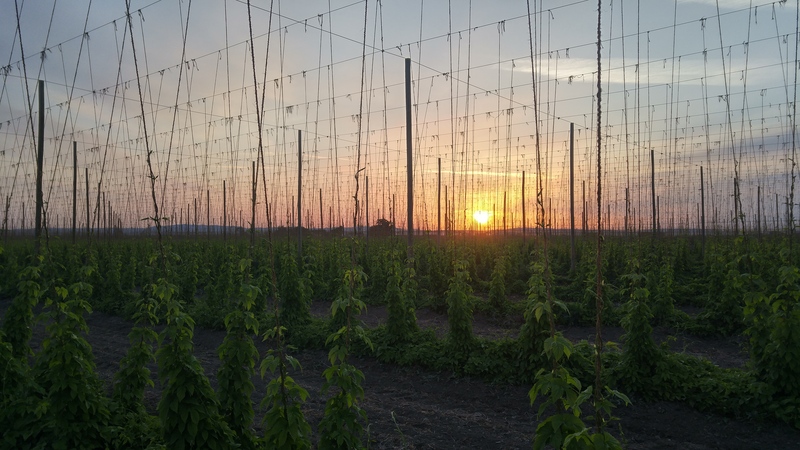 On May 25th, I arrived in Toppenish, Washington where I began work at Perrault Farms, Inc. located on the Yakima Reservation, one of the largest hop growing regions in the world. 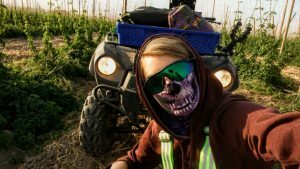 Perrault Farms owns and farms over 1500 acres of commercial and organic hops and 30 acres of organic blueberries. 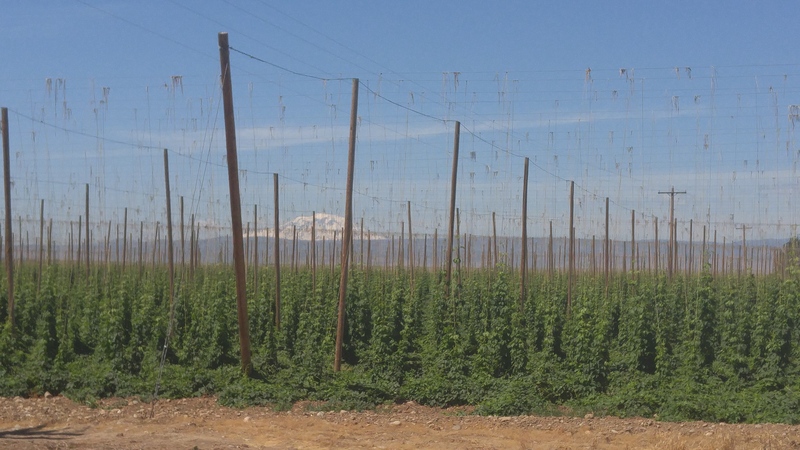 Perrault Farms works alongside Select Botanicals Group, Yakima-Chief HopUnion, and Hop Breeding Company to develop new hop varieties and further their sustainability. I am here working as an IPM scout, searching the fields for pests and disease. 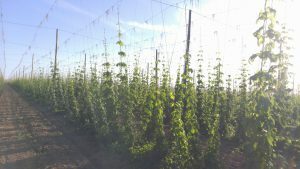 I will be spending the summer scouting Citra and Mosaic hop fields, along with a few experimental varieties and a small acreage of Ekuanot and Palisade. 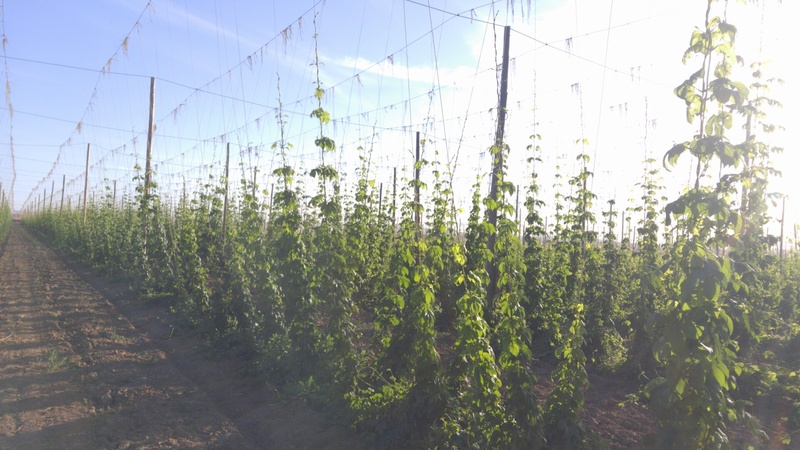 All of these varieties were developed by either Select Botanicals Group (SBG) or the Hop Breeding Company (HBC). One of the more well-known varieties that was discovered by Perrault Farms was Simcoe. Fun Fact: Simcoe was one of the hops chosen to brew the Windsor Knot, which was the beer served at Harry and Meghan Markle’s wedding in May. My day begins by arriving to the farm at 5:00 AM, just before the sunrises. There is a lot of work that needs to get done so the earlier we arrive, the earlier we finish scouting our assigned fields. This is also nice because the mornings here are cold, so we don’t have to work outside during the heat of the day. We load up our ATV’s with what we will need for scouting and head out. Each weekday is assigned about 4 to 6 different fields that need to be completed with different scouting density levels. Scouting density levels are determined by the degree of pest or disease thought to be present in a field. 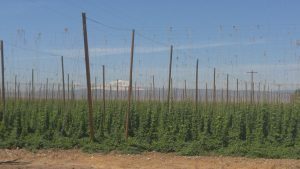 A level 1 density is scouting one geographical point, which is described as a pole-to-pole section of 15 hops, every 15 rows. Level 2 is 2 points every 10 rows and level 3 is 2 points every 5 rows. The first week we began scouting for powdery mildew and downey mildew. Powdery mildew appears near the hill (base) of the bine and will spread upwards. Bines are susceptible when temperatures are high and moisture is present in the hill. It appears as a fuzzy, white, misshapen blotch on the leaves and if not treated properly, can devastate the entire crop. 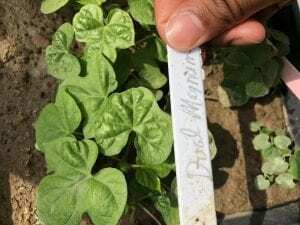 Downey mildew appears in moist conditions. Therefore, it is typically seen after a heavy rainfall. 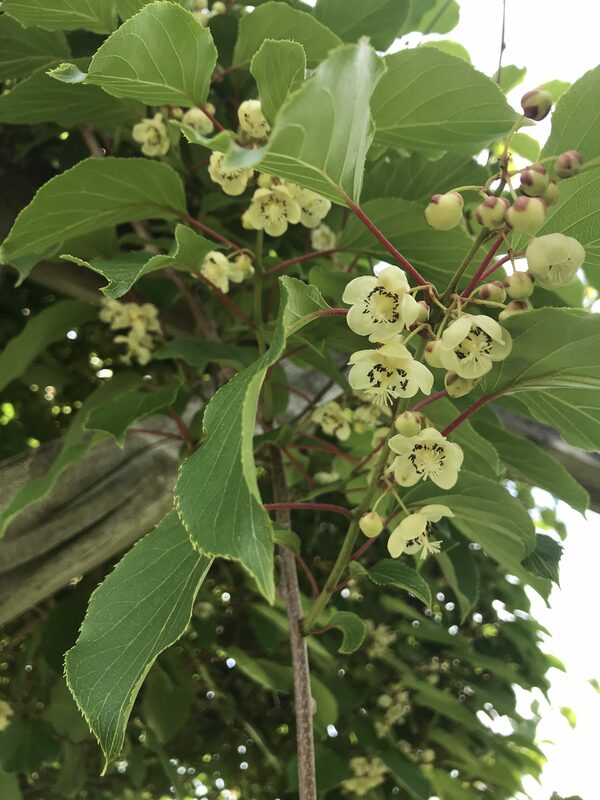 It’s characteristic traits are short, stunted vines growing near or around the hill, with downturned yellow-colored leaves and black spores on the underside of the leaves. 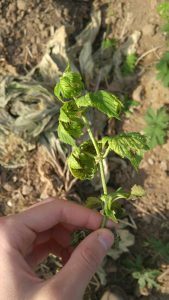 A bine infected with downey mildew will only grow to about half it’s typical height and therefore yields will be significantly lower. 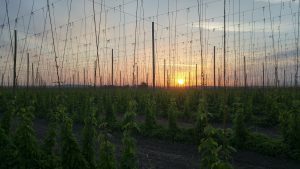 My project for the season is to measure nutrient levels within the vegetative growth of the bine and determine what nutrients the hops are deficient or overly-sufficient in and how to resolve the issue. Old and new leaf samples of various fields are collected to be tested. 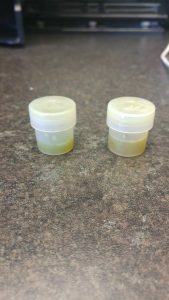 The reason for collecting both old and new leaf samples is to see if the nutrients from the old samples have been are mobile, and therefore present in the new leaves. 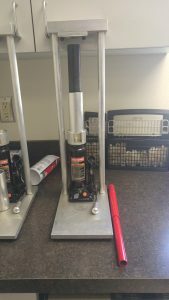 The leaves are placed in a hydraulic press which squeezes sap out and into a small sample cup. I will then take these samples and run sap analysis which involves the use of six different sensors. 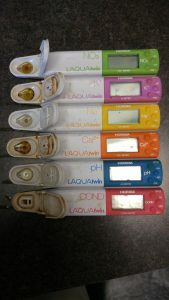 These sensors measure the levels of nitrate, potassium, calcium, sodium, pH, and water conductivity. Thus far, there have not been any determinations made on what nutrients need to be applied to fields but I am hoping to help make these decisions starting next week! We have also begun scouting for pests and beneficials, however, since it is early in the season, and the weather has been rather mild, there hasn’t been too many sightings of either. Next week should begin to pick up with pest pressures and I will be reporting back with more information and pictures on that! Corn, Soybeans, Wheat, Malting Barley, Green Snap Beans, Beets, Peas, Hay and More: Oh My! My first few weeks at Kreher Family Farms have been an adventure, to say the least! Although many of you may have never heard of Kreher Family Farms, you have probably encountered their products. Have you ever bought eggs at Wegmans or Egg Lands Best eggs? If the answer was yes, then you have supported the Kreher Family! Kreher Family Farms is a large Organic and Conventional Poultry and Crop farm that spans many counties in Upstate New York and was founded in 1924. We grow crops and/or raise chickens in Erie, Genesee, Monroe, Livingston and Wayne County. 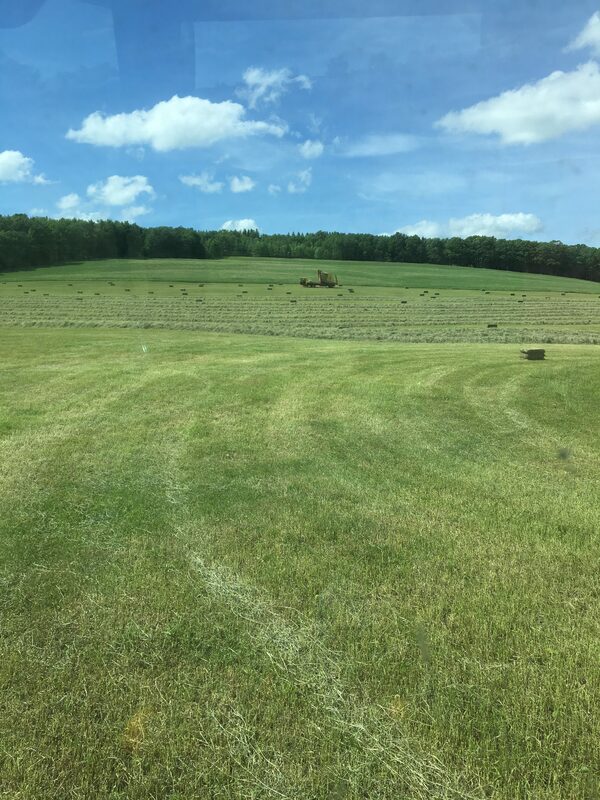 A beautiful day to make 1st cutting hay on land that is being transitioned from conventional to organic. just as cropping season was kicking into high gear. My first few weeks have been spent doing a variety of things including scouting for early season diseases and pest, creating a management plan for combating the Bind Weed that is scattered throughout the farm and thinks our corn is the perfect thing to grow up and making hay. I have also spent a bit of my time typing field address into my GPS to find the fields, but now I have learned the fields and by the end of summer will probably be able to find them with my eyes closed! I have learned a lot about a variety of insects and disease in a variety of crops thus far because Kreher’s embrace diversity(in case you couldn’t tell by the title!). The first beets of the year! 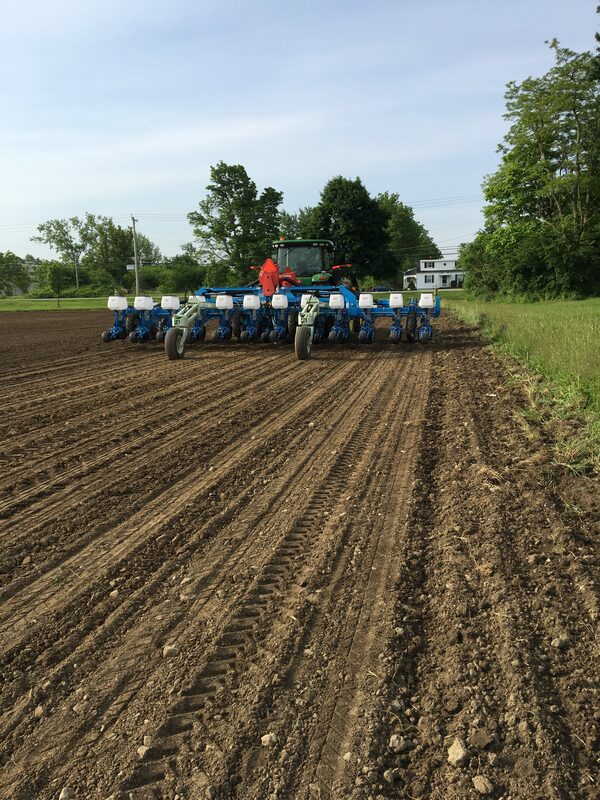 Beet planting will last for many weeks because the processor can only handle so many a day during harvest. Many of us have heard the old wise tale that diversity is beneficial, especially in organic crops. Kreher’s embrace diversity and have been successful in using diversification of crops to help them control disease, pest and weed pressure. All the crops are produced organically. 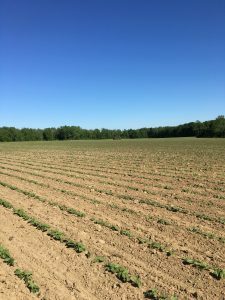 The green beans and beets are grown for human consumption while the field crops are grown for the chickens. Another unique aspect of the operation is that along with the chickens and crops, Kreher’s also produce and market their own organic compost and fertilizer! 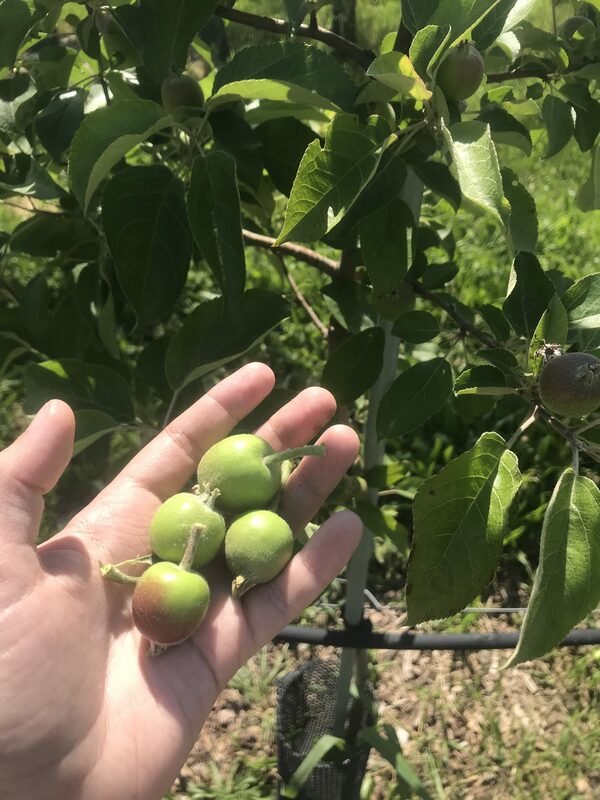 I have learned a lot in my first few weeks here at Kreher Family Farms and I am sure I will continue to learn more because this operation is so intricate and diverse! Until next time, I will continue to enjoy my free employee eggs and embrace the fact that I have yet to see a chicken!